Fit versus Fat. Or is it? Is it possible to be fit AND fat? Unfortunately yes. Many experienced scholars have written on the subject (a few articles linked below), but I wanted to briefly touch on it. Why? Triathlon racing season is right around the corner for me and I’m a little fluffy. It’s common (and healthy) for athletes to gain a little weight in the off season. This fact was also multiplied for me post Houston Marathon. Several members of Big Pistachio Racing Team were lamenting our off season weight. After finally stepping back on the scale, I knew it was time to get back to work. 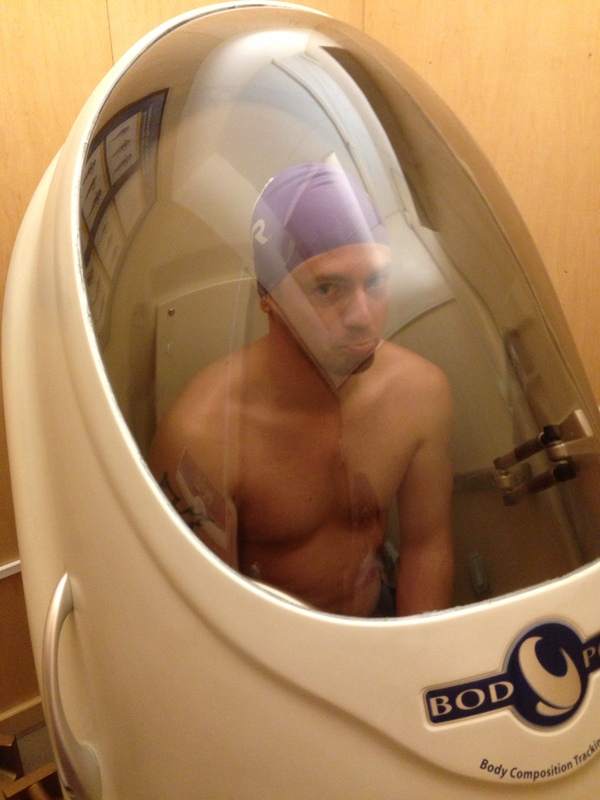 We quickly worked up a scheme to get our team ready for race and bikini season… “The Big Crackdown Challenge.” Everyone would begin by using a Bod Pod analysis from our friends at Castle Hill Fitness. Teams would be split male vs. female, based on total weight, lean muscle mass, and body fat mass percentages from start to end. A two month challenge and a way to support each other and meet our goals. The odd phenomenon of fit and fat is perplexing. For instance last week I logged 10 solid hours of training via swimming, cycling, running and weights. Today I went for my Bod Pod session at Castle Hill. It’s a pretty simple machine and a very quick test. It confirmed my fears, I’m fit and fat. I’m rocking a 22.4% body fat and it is the heaviest I’ve been in over a year. I don’t want anyone to take my thoughts as demeaning to those who are trying to lose a lot of weight. That’s not my intent. In fact, when I was at my lowest (& will be soon) I have lost over 50 pounds. I have several friends right now who are mid-way through an incredible weight loss journey. It’s inspiring to watch them as well as look back on where I started several years ago. Now that the numbers are in front of me I can’t shy away, it’s time to get to work. Seriously. 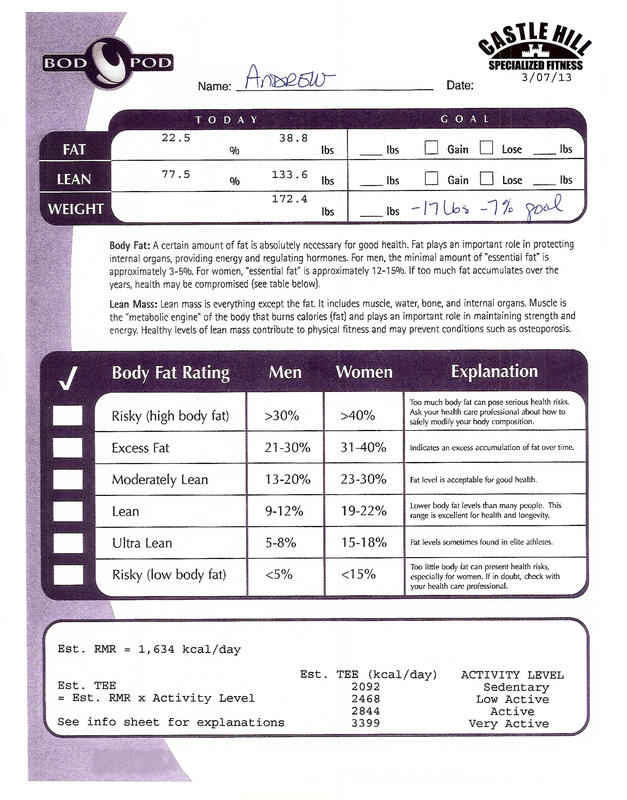 So back to the fat/fit thing… If I’m already logging close to my ‘max’ training hours right now, how then am I able to lose some additional fat? Simply put, this shows how important diet is versus exercise. There are quite a few little tweaks that I need to make to my diet in order to prepare myself for racing season. Staying closer to leaner proteins, more veggies, more controlled carb intake, less eating out and less beer. There are also no healthy shortcuts, I don’t need to skip meals or overestimate how many calories I’m burning. I’m excited to get it done as my fitness over the winter months has really taken off and I have some nice goals laid out for this year. I know a lot of you are on the journey with me, so what’s your story? Fat- 15.5% (-7%) as a side note I realize this is probably not likely unless I lose beyond 17 pounds. It would be virtually impossible to ensure all of my weight loss at this point is purely fat. But it’s a goal nonetheless to see what 15% would look like. It’s been quite the fall and winter for me. Both personally and with training. I opted to take a new job at the end of September. I was in need of more stability and less insanity. My family needed me to be present and not constantly traveling last-minute for work. With that change came a few added benefits. One major being that I no longer traveled for work. Which meant more time at home and with the family, and I would be able to finally capitalize on a consistent training schedule. I decided this would be the year that I would really tackle my key races. So I signed up with C4 Endurance Training. Coach Troy is a good friend and has tons of experience with marathons and triathlon, especially Iron distance so I thought it would be a great fit. I had entered the lottery and signed up for the Houston Marathon back when it opened earlier in the year. I knew I wanted to target a sub 4 hour marathon to see where my fitness was. 4 hours sounds slow to the likes of some of my friends and uber athletes. But being my second full marathon it would be a great benchmark and a nice PR if I could hold it. Training went really well and the mileage started to add up quickly. It was nice having a coach to bounce questions off of and to truly not worry about what workout was next. I think there was only one workout I bombed and that was because I didn’t really understand what he wanted and didn’t ask. 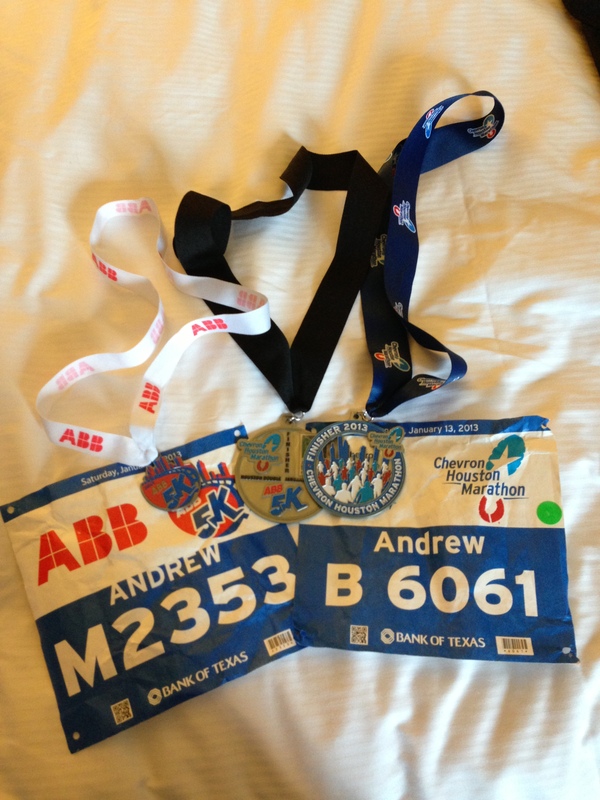 I used the Dallas 1/2 Marathon as a training run to test some of my fitness and goals for Houston. It was hard to hold back because I felt like I was in PR form for the 1/2 Marathon, but my ultimate goal for the off-season was the Marathon PR. The run went like clockwork with his plan. I continued to nail my long runs and even logged a total of 158 running miles in the month of December. Insane. And awesome because I was feeling good and knew I would nail my goals in Houston. 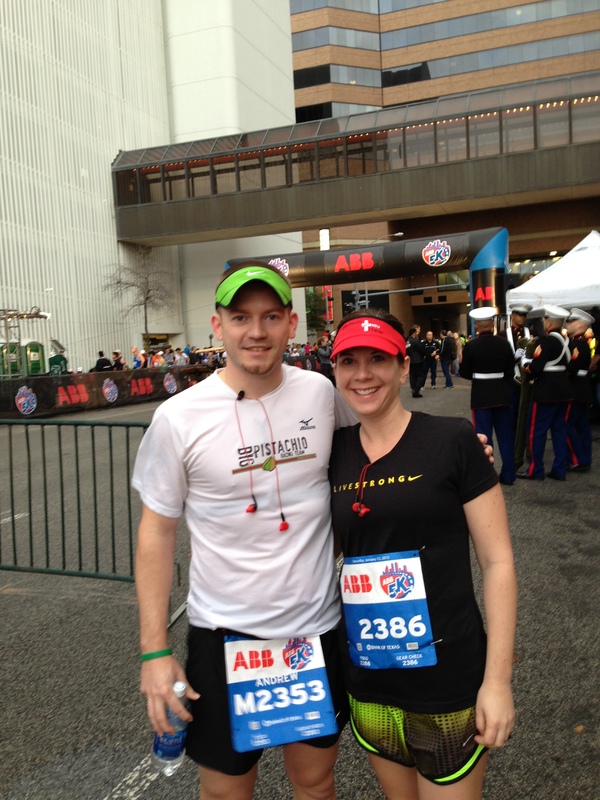 The wife and I opted to travel to Houston on Friday night and run the ABB 5k on Saturday morning. I would use this as a very slow shakeout run, and my wife Jillian would go on to set her own PR for the 5k! Weather was typical miserable Houston humidity. A cold front was moving in that night with rain, but the million dollar question was when would it hit? We went to the Expo, got some swag, picked up a couple of gifts and had a nice lunch. It was great since we were staying at the Hilton which was the host hotel. Oddly enough, the elite runners were staying on our floor and we bumped into quite a few of them. For dinner that night we met up with Matt and his family for some pasta dinner. This would be Matt’s first full marathon and another friend of ours was going to pace him through the day. Our biggest concern was getting to the start line and it not be pouring rain. Fast forward through me setting out my gear options and going through my pre-race routines. It was going to be a great day. The cold front had come in. My pace band was carefully marked with my nutrition/hydration strategy. I walked over to the convention center to drop my dry clothes bag. I had hoped I would run into Matt & Ryan but with 20,000 people that didn’t happen. I make sure everything is set and I head out to the start line. Wow. It’s windy (15-20mph). And cold (40 degrees). And yup, there’s the rain. It was a miserable walk to the starting corrals. Once I got on my corral, I though to myself “at least I’m surrounded with people as crazy as I am, we’ll all be miserable together.” Fortunately the wait for the start wasn’t horribly long, but it was a long 15 minutes standing in the rain. The gun went off and it was game time! The first goal was to start slow, not succumb to the hype and excitement of everyone around me. There would be a time to go fast, and I would pass lots of them. The first few miles were pretty darn miserable in the cold rain. We crossed an overpass before mile 1 and the chill just went straight to the bones. But sure enough the miles started clicking off. I passed the 5k checkpoint pretty much right were coach wanted me to. Time to pick up the speed a bit. Legs felt fine and I was finally starting to warm up. As I reached for my salt tabs, I didn’t feel them. In a moment of panic I figured they had fallen off. I told myself not to worry, I don’t need them and I can just drink more Gatorade. A few minutes later I reached around the front of my SPIbelt I felt the dispenser. It had just moved! Whew. Back on track. I chucked my gloves off at mile 6 since they were soaking wet and didn’t do any good. Another checkpoint down at the 10k. Pretty close to the goal, now time to turn in the true race pace and see what happens. Around mile 8 I finally took off my rain poncho as most of the rain had cleared and my shirt was wet from sweat anyway. I stuck it in the back of my shorts fearing that more rain would come. The 15k and 20k checkpoints came and went without much ado. When I arrived at the 13.1 halfway checkpoint, I was pumped. My time was 1:59:16. As long as I could at least match what I did for the first half I would meet my goal. But the goals didn’t stop there. We wanted a negative split. Prior to training with coach Troy a negative split was something like a unicorn to me. I’m sure they exist somewhere, but not around me. With his guidance and my prep work it was time to make it happen. Miles 15-18 were not so much fun. I was able to hold the faster pace but was suffering a bit as we were traveling into the wind some. I kept pressing on longing to see the 20 mile marker. Some say a marathon is two races- 20 miles and then trying to hold on to another 10k (6.2 miles). This can be fairly true as the mind starts to play some tricks on you. The plan was to open up a quick steady pace, then empty the tank the last few miles. As I picked up the pace a little more, I quickly realized that was going to be about it. There would be no insanely fast last few miles it would have to be just steady. I start to notice that I’m passing quite a few runners. Just like Troy said I would. This was crazy awesome. I was hurting and ready to be done and couldn’t believe I was actually pulling it off. Where so many runners had gone out to fast or emptied the tank early, I was making up time. Every second I went faster it was more time off that I would beat my goal by. I start to notice a bit of uncomfortable rubbing in my shorts, uh oh. For anyone who’s ever run you know that once you feel chaffing it’s too late. I apply a bit of lube on the run and know I’ll have to pay for that later. As we reenter the downtown area my GPS goes haywire and drops the signal. I had been warned about that by others who have run downtown Houston. I didn’t worry knowing that I just had to friggin’ run. I wouldn’t know what pace I was holding and it didn’t matter at that point. I give it everything I’ve got and round the corner near the hotel. One last turn and I was home. I could hear the cheers from TONS of people who had braved the cold rain to support their insane runners. I take one last glance at my watch and know that I’m going to come in at 3:55. Amazing feeling! I was so relieved! It’s hard to describe, but I felt justified for lack of a better word. I ‘felt’ like I had it in me but I wasn’t sure I could finally pull it out. I got my finishers medal, tshirt and beer mug and head off to get my dry bag. I can’t remember doing that in a race before but I felt like a million dollars after changing into dry clothes. I highly recommend it! I go find Jillian who gives me a huge hug and was almost excited as I was that I hit such a good time! With the excellent weather we decide to forego any finish line festivities and go get cleaned up in our warm hotel room. A quick stop for some fajitas on the way home and I was set. Time to recover. 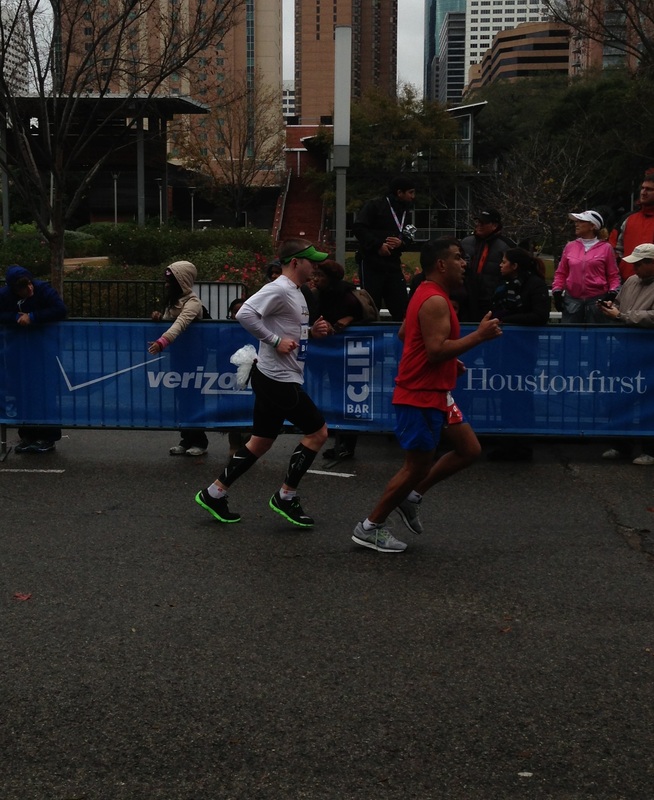 During the final 4.5 miles I passed 269 runners, only 2 passed me. February- New Tri Bike for my birthday! March- First trip overseas to Spain. April- First Tri of the year. Turned to Duathlon. 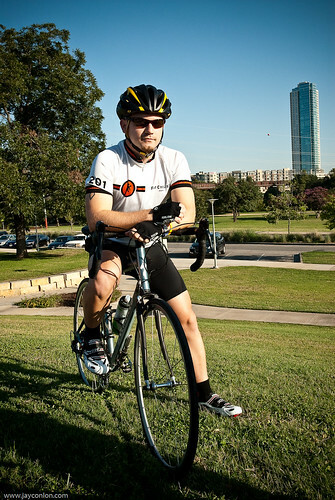 May- Please be Kind to Cyclists rally to support human life at the Texas Capital. June- First trip to Hawaii. July- Spent the month outdoors with friends. August- Celebrated 10 year anniversary with my amazing wife. October- Met cycling legend Jens Voigt. November- Texas Tri Series finishers party with Big Pistachio Racing Team! December- Neck deep in marathon training, but still enjoying the little things and important things in life.